This CD is being released immediately following the publication by Chicago Review Press of Honeyboy's autobiography, of the same title. The recording captures Honeyboy in concert, playing a mix of his favorites and new material, joined on half the cuts by his long time friend Carey Bell on harmonica. After 65 years of living the blues, Edwards shows no signs of letting up. His unique solo interpretations of Hide Away - the Freddie King standard - is worth the price of admission. 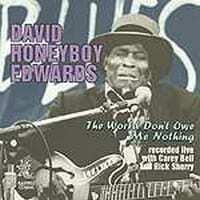 David Honeyboy Edwards, the “Last of the Great Mississippi Delta Bluesmen” has died. On the morning of Monday, August 29, 2011, about 3 am while resting peacefully at home, Honeyboy moved on to blues heaven. He lived a long, full life, and he felt at peace. He loved to say, “The world don’t owe me nothing.” Just shy of his 96th birthday, Honeyboy played his last gigs at the Juke Joint Festival and Cathead Mini-Festival in Clarksdale, Mississippi April 16 and 17, 2011. Prior to his health turning for the worse in late April, Honeyboy was scheduled to play numerous gigs in Chicago, across the USA and in Europe, including today at Millennium Park in Chicago for the noon time concert series. His manager Michael Frank had to cancel all those dates due to Honeyboy’s declining health. He maintained a strong spirit until the end, telling stories and showing off his dexterity in his hands. 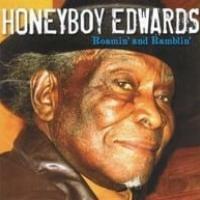 This is a companion disc to Honeyboy Edwards' autobiography of the same name. 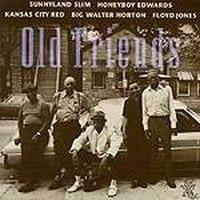 It features full-length performances along with interview segments that tell some of the great stories of the blues, particularly trenchant being Edwards' version of the night of Robert Johnson's death. Musical high points include several turns on Johnson material like "Walkin' Blues," "Sweet Home Chicago" and "Crossroads," the latter featuring some slashing slide work from Edwards. 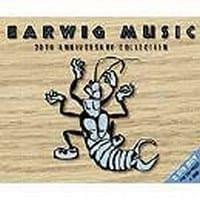 Carey Bell contributes some great harp to Edwards' lone guitar, and on other tracks Edwards is ably supported by Rick Sherry on harmonica and washboard. With his timing as idiosyncratic as ever, Edwards also brings a couple of fine originals to the table with "My Mama Told Me" and "Every Now and Then." 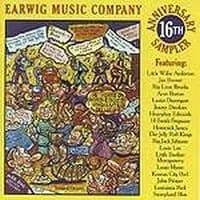 A great lion-in-winter recording with more than its share of oddball quirks, this is one great listening experience.